Lying on the floor with his eyes closed, Ian A. Wallace savoured the scent of linoleum. It was exactly as he remembered it. The same fragrance he’d smelled as a child. He looked around and recognized the tiles, the size and design. And then he saw the stairs. He ran up, each stride reaffirming that he was at the right place. He headed to the attic. It was there where he kept his toys. When he saw them, he let himself fall to the ground. And he started to play. But Wallace wasn’t back at his childhood home in Edmonton. He was 1,678 miles away in Toronto. He was learning how to become a clown, and this journey into the recesses of his mind was part of his training. The year was 1972. 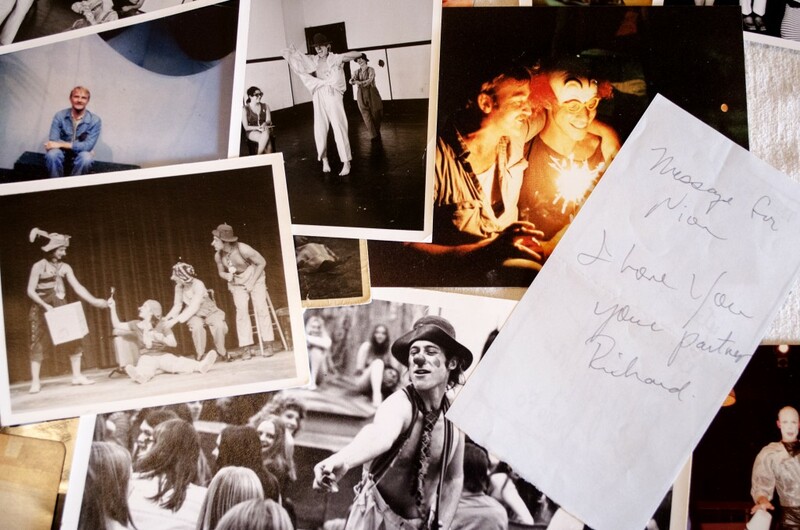 Wallace was participating in one of the first workshops conducted by Richard Pochinko, who would one day be recognized as a visionary of theatre — Canada’s clown master. At the time, Pochinko was setting out to create a new style of clowning, one that wouldn’t rely on squirting flowers or pies thrown in faces to make audiences laugh. The humour would flow from flashes of insight about the human condition, dark and frightening insights, even. Pochinko’s practice of clowning would tap the artists’ own experiences and identities. It would allow performers to celebrate their Canadian identity and heritage, and, in the midst of the Cold War, reflect on the country’s and the world’s most pressing affairs. One of the fundamental training methods used by Pochinko asked students to immerse themselves in their own memories and connect with their childhood innocence. For Ian Wallace, this was not an easy thing to do. On that day in 1972, he was a man still in his twenties, with no formal training in any kind of performance and no conscious desire to unlock deep mysteries within his psyche. He had come to know Pochinko as a friend, and then as something more. And now Pochinko was the reason Wallace found himself pursuing, without much luck, the art of clowning. Already, Wallace had attempted the “Return to Childhood” exercise six times, each time failing to make the journey of the mind Pochinko requested of him. But this time was different. This time Wallace succeeded at arriving at his beginnings, a connection to childlike innocence he had assumed was lost to him. That success gave Wallace the confidence to press on. He never looked back. Forty years later, Wallace is recognized as one of the best clowns of his generation. Pochinko died too soon, but his creative vision lived on. Wallace has carried on that legacy, helping to develop and evolve the clowning technique that Pochinko formulated. And he has done this by defying doctors who told him that he, like his friend and mentor, was doomed to die young. 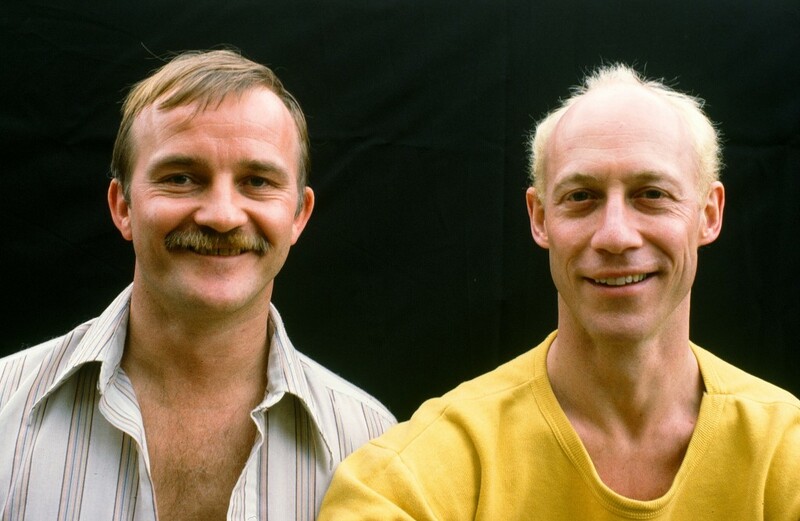 Now 70 years old, the once blonde Ian Wallace is bald, his face is wrinkled. He lives alone in a small apartment in downtown Vancouver, British Columbia, around paintings and props he’s made throughout his life. When he recalls the past, he closes his eyes and tries not only to remember, but to relive the memories. Laughter often bursts with the funny stories, whimpers with the painful ones. For Wallace clowning isn’t just theatrical work. It’s deeply spiritual, he claims. And he believes that someone — or something — bigger than himself commanded him to become a clown. Today Wallace travels unrecognized as he wanders around his city, a Canadian cultural icon without celebrity. There was a time when clowns were central to the public’s imagination, some even the rock stars of their day. That was when three-ring circuses roamed the world and Chaplin and Keaton were the biggest movie stars. Wallace believes the time has come again for clowns to take centre stage in our society — to serve as mirrors in which we can see honest reflections of ourselves. 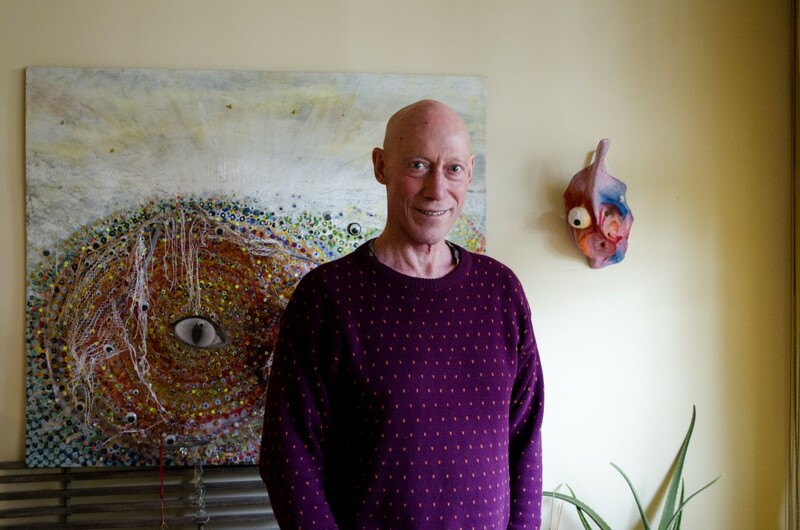 When Ian Wallace arrived in Montréal for Expo 67, he knew he was done teaching grade seven arts and math in Edmonton. While he enjoyed the kids, the system felt too constraining. Pochinko and Wallace met again a few times during Wallace’s stay in Montréal. And when they parted ways, the two stayed in contact. In 1969, after spending some time traveling around Europe, Wallace visited Pochinko in Halifax, where he was working as a theatre’s stage manager. Wallace didn’t intend to stay long. Soon, though, he moved in with Pochinko and, during the day, worked by his side building stage props and changing sets. It was Wallace’s first, formal introduction to professional theatre. As Wallace remembers his roommate then, Pochinko wasn’t home much. His various lovers took up most of his time. But when he was around, the two had long, deep conversations, mainly about Pochinko’s efforts to successfully juggle his multiple relationships. “It was the sixties, a time of experimentation and all of that,” Wallace said. “He was just getting very confused about it.” Their conversations usually ended with the two falling asleep together. Perhaps the dream reflected Pochinko’s own feelings. 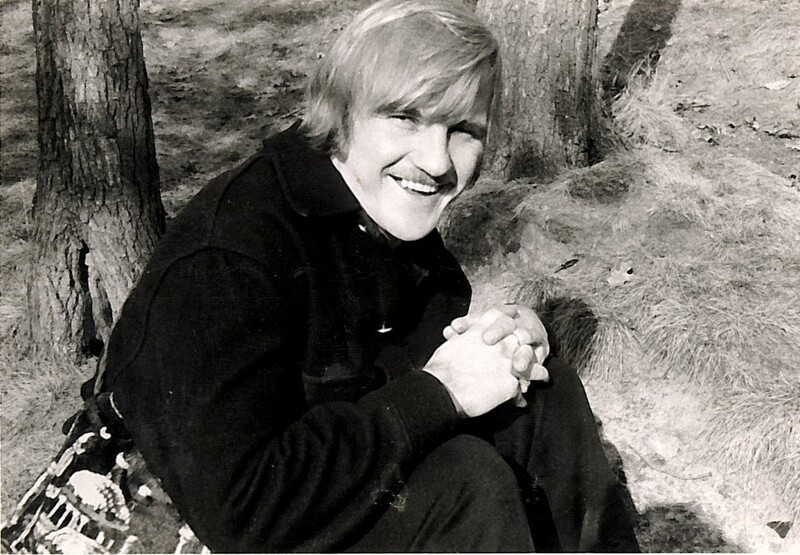 His early experiences in theatre made him “feel restless and confined,” he told Eileen Thalenberg in an article she wrote about him in 1981 for EnRoute magazine. Pochinko had left his parents’ farm in Selkirk, Manitoba at the age of 14, and studied theatre, dance, music and film production. Now, already a veteran of sorts, he felt that the theatre of the late ‘60s lacked form and roots. So, two years later, Pochinko embarked on a European journey to broaden his knowledge of theatre and to find the building blocks for his unique approach to performance. One that would help people break through the glass that encased them. It was a wet, cold night when Pochinko and Wallace arrived in Paris. France was the last stop of the journey that had taken Pochinko through England, Italy, Poland, Czechoslovakia, Austria and Denmark. The trip allowed him to touch base with companies like the National Greek Theatre and avant-garde directors like Eugenio Barba and Jerzy Grotowski. Wallace was his travel companion. He and Pochinko had become lovers. 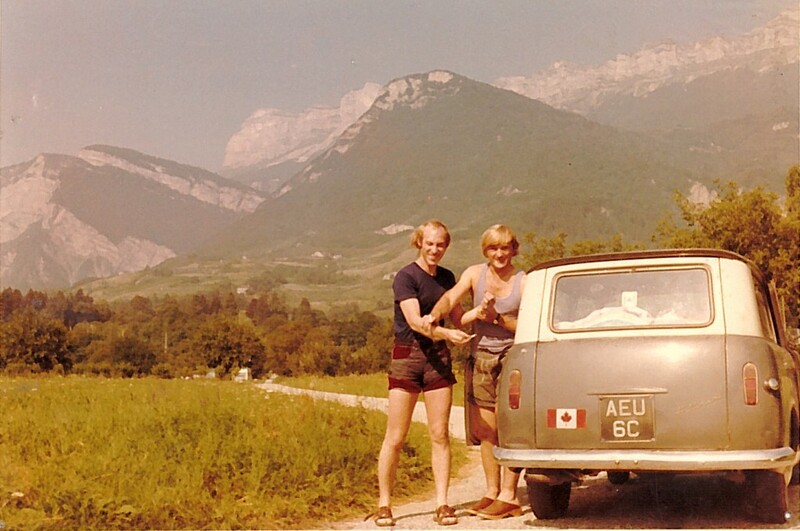 Tired from the bus and ferry rides that got them from London to Paris, the couple set out to find a hotel. “We paid what [seemed] like an exorbitant amount of money for [a] room with a bath, but it was heavenly to be together and warm and in love in Paris,” Wallace wrote years later on his personal website. The couple’s Paris love story had a rude awakening the next morning. They didn’t have enough money to keep the room they spent the night in. The previous legs of the trip — which Pochinko was financing through a Canada Council research grant and Wallace through his personal savings — had already drained their pockets of money. Luckily for them, the people who ran the hotel came to their aid. They offered the couple a much cheaper rundown room with cracked floors and peeling wallpaper. Pochinko was reluctant at first, but Wallace convinced him to take it. The decision to stay was ultimately a pivotal one. The hotel where they lived was right across the street from the Cirque d’Hiver. The circus would give Pochinko his first taste of clowning. Pochinko’s stay in France gave him another reason to be interested in clowning. He was in Paris to attend the famed L’École Internationale de Théâtre Jacques Lecoq, which included in its program the study of mask, mime and clown techniques. At the school, Pochinko was exposed to Lecoq’s methods of physical theatre. He learned about the neutral mask — a full-face expressionless mask that disables voice and facial expressions to compel the bearer into communicating corporeally. And he also learned about the European tradition of clowning. About clowns who — like Grimaldi — made people laugh by parodying socially accepted behaviour. About clowns who — like Chaplin — used satire to comment on society. One night in Paris Pochinko began to talk in his sleep as he had done in Halifax. He started saying that Wallace was destined to become a clown and that the two of them would revolutionize clowning in North America. Standing in the middle of the stage in 1972, Ian Wallace stared at the audience. A pair of suspenders hiked up his white pants, a striped tie dangled down his bare chest. His cheeks were covered with reddish makeup and a red, round piece of rubber covered his nose. Alone on stage, there was no script. Only the clown and his audience. And infinite possibilities. It was showtime. Wallace debuted as a clown in a show based on an Iroquois creation myth directed by Pochinko. The play, which toured high schools in Toronto for a year, marked the beginning of Pochinko’s experimentations with the techniques he learned at Lecoq’s school. The training for the show — which relied heavily on the use of neutral masks to explore movement and non-verbal communication — was a powerful learning experience for both the teacher and the actors. For Wallace, the play was the perfect opportunity to develop what he calls “his clown instincts.” Halfway through the show — right after he put on the clown nose — he was left on his own and had the opportunity to improvise. This is what Lecoq and Pochinko called a “clown turn,” an opportunity for the clown to present him or herself, discover the audience and perform a specific action. In Wallace’s case, blowing a whistle. “The cue for [the rest of the cast] to come out and start the circus, which was the next part [of the show], was me blowing my whistle,” he recalled. What Wallace did before he blew the whistle was entirely up to him. “What is this?,” he once asked the audience while holding up the whistle. “Put it in your mouth,” yelled back the kids. He engulfed it with his mouth, to the delight of the audience. At another performance, a child told him to blow on it. So he opened his mouth and with profound futility puffed at the whistle as hard as he could. He also usually jumped off stage to have closer, more intimate interactions with his audience. As he got more comfortable in his role, the turns grew longer. 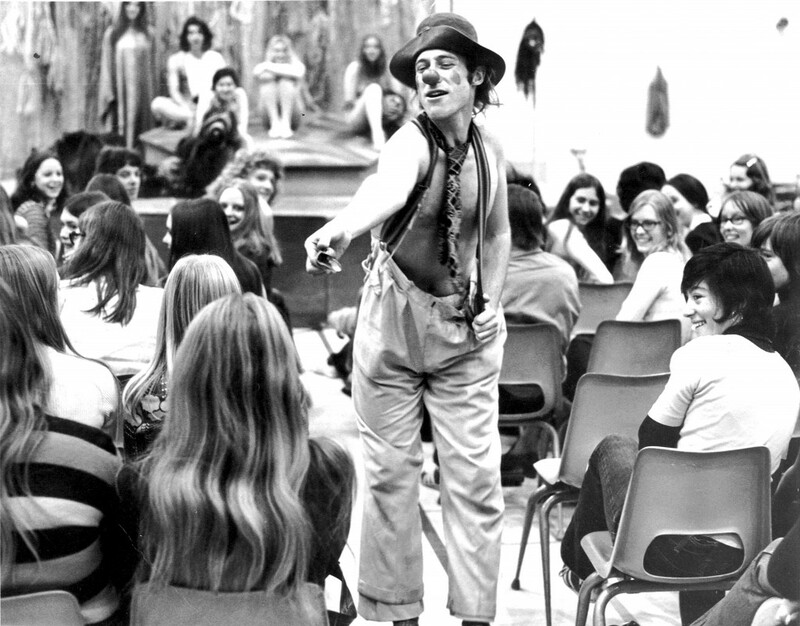 The following year, Wallace again played the clown in a production directed by Pochinko. As Pochinko started experimenting with new techniques, Wallace became the canvas upon which Pochinko perfected his own developments. But in 1974, their personal relationship got in the way of their professional partnership. So he ended the love affair and left for Stratford to work as an actor. Dressed in a red and white striped dress, yellow rain boots and a blue belt, Ian Wallace propelled himself into the ring. The year was 1974. The clown had made it to the circus. Carrying a bucket of water in one hand, Wallace took centre stage. He was getting ready to do his laundry. Next to him another clown, also carrying a bucket, made her entrance and prepared to do hers. The two clowns looked at each other, walked around each other. Every look — every step — became into a tension builder. Each was in the other clown’s space. Only a few seconds in the ring and the clowns had already transformed it into a battleground. Wallace gave the first blow. He picked up a wet, red piece of clothing from his bucket, swung it and hit. The other clown retaliated with a blow to the face. He responded by emptying his bucket on her. Then, the chase started. He ran towards the audience, looking for cover. Behind Wallace came her, and with her the bucket. And the water. Trapped between his rival and the audience, Wallace got ready to get wet. So did the audience. But a turn of the other clown’s wrist as she was about to splash him allowed her to throw the water safely away from the audience. The crowd, delighted, burst into cheers. Two years after making his clowning debut, Wallace found himself doing the typical slapstick shtick at the circus. It was a crowd-pleaser, but not what his mentor Pochinko had in mind. At the time, Pochinko was ready to test his latest development, a new clowning method inspired by Native American elements and traditions. So he selected 28 students for a three-month workshop that culminated in a two-week tenure with the American Royal Brothers Circus. Wallace was one of the recruits. Wallace didn’t lose contact with Pochinko during his time at Stratford and was eager to take part in Pochinko’s new workshop. Their love affair ended for good the day he left for the theatre company, but their creative companionship was just getting started. Borrowing from the concept of the Cosmic Tree — a motif present in various North American Aboriginal traditions — Pochinko’s method involved creating six masks, four of them reflecting north, south, east and west, the other two the underworld (the below) and the spiritual world (the above). Each student created all six masks for their own use. Before they did, they closed their eyes and concentrated on patterns like specific breathing and sound rhythms. Then, the students internalized the patterns and sculpted them in a piece of clay they later used as the mould for the mask. Pochinko believed that what defined clowns was their capacity for regaining their innocence after the experience of living, and for being able to laugh at themselves. 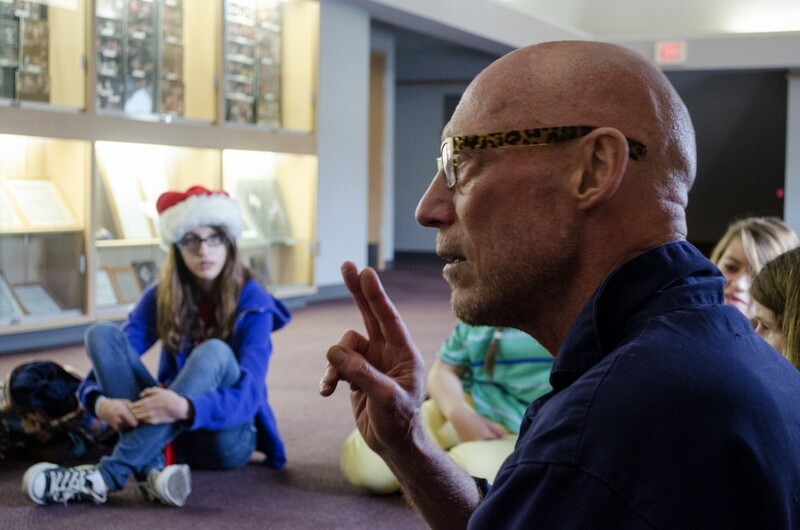 So he asked his students to wear their masks and do some of the exercises he learned with Lecoq — like one that asked trainees to represent how they would wave goodbye to someone they deeply loved. Pochinko envisioned his new breed of clowns serving the same purpose as the Native American ceremonial clowns. In various Aboriginal traditions, ceremonial clowns had the role of transgressing the boundaries of accepted behaviour during ritual ceremonies, of helping validate or tear down the limits of what was socially accepted. By blending the Native American clowning tradition with the European approach, Pochinko developed a unique way of clowning. A Canadian clowning technique. When Pochinko and a young, idealistic troupe of clowns joined the American Royal Brothers Circus, they thought they were about to change North American clowning forever. Jan Kudelka, who was part of the group, captured her experience at the circus in her award-winning play, Circus Gothic. “We were going to meet the circus, and we were going to bring them a kind of clowning they’d never seen before,” she wrote in the play. But reality didn’t even come close to what the clowns expected. There was no interest at the circus for Pochinko’s technique. They wanted slapstick. The experience taught Pochinko that the circus tradition relied on gags instead of the clown’s personality. So he turned his attention to exploring the clown in the theatre. A year after the workshop, Pochinko co-founded the Ottawa Theatre Resource Centre (TRC). The TRC was born from the desire to continue exploring, teaching and developing the technique. For Jan Henderson, a teacher at University of Alberta’s Department of Drama and one of the members of the TRC’s board of directors, the work proved extremely powerful in a personal way. But not everyone shared her appreciation of the company and the work. Wallace acknowledges that there’s an important spiritual component in the work. Clowning is essentially about opening hearts, he claims, and that’s spiritual. But they didn’t want the technique to be associated with the negative reputation religions often have, he said. The Ottawa Theatre Resource Centre closed its doors after a year. The “cult” label, according to Wallace, played a role in the decision. “People are afraid to show emotions. You know, we cut out so many things, just in order to survive, but I think you gotta let them out if you’re really going to survive,” Pochinko says on film in To Be A Clown. Three years after its initial closing, the TRC reopened its doors in Toronto, this time with Wallace working alongside Pochinko as co-director. For its new phase, the TRC’s mandate expanded. Not only would they provide their distinctive approach to clowning, but they would also foster the growth of new theatrical forms. Kabaret de la Vita, Ian Wallace’s one-man show, was the result of their experimentation. It was also the result of Pochinko’s mandate to dig deeper, to let it all out. Pochinko, who directed Wallace throughout the whole creative process, asked him to dig into his fears. The idea of dying, which had haunted Wallace since he was a little kid, was the basis of the show. But that was not all. Wallace wanted Kabaret de la Vita to comment on the blending of masculine and feminine characteristics in our personalities. In Kabaret de la Vita, Wallace played Nion, a “space baby” born in earth. Ignorant about the world and its ways, baby Nion transformed frantically from male to woman to male again in an exploration of sexual identity. Then, he dressed up as iconic figures like Marilyn Monroe and Elvis Presley to probe fame, fortune and love. Finally, Nion died and was reborn as the ringmaster, the controller of the three elements explored. Kabaret de la Vita went beyond the theatre-clown genre to include film, cabaret, mime, burlesque and circus elements. The creation of Cabaret de la Vita from Carlos Tello on Vimeo. Wallace’s one-man show debuted in 1981 and became a national success. In 1982, the Toronto Alliance for the Performing Arts nominated Kabaret de la Vita for four Dora Mavor Moore Awards, including outstanding performance for Wallace, outstanding direction for Pochinko and outstanding production. 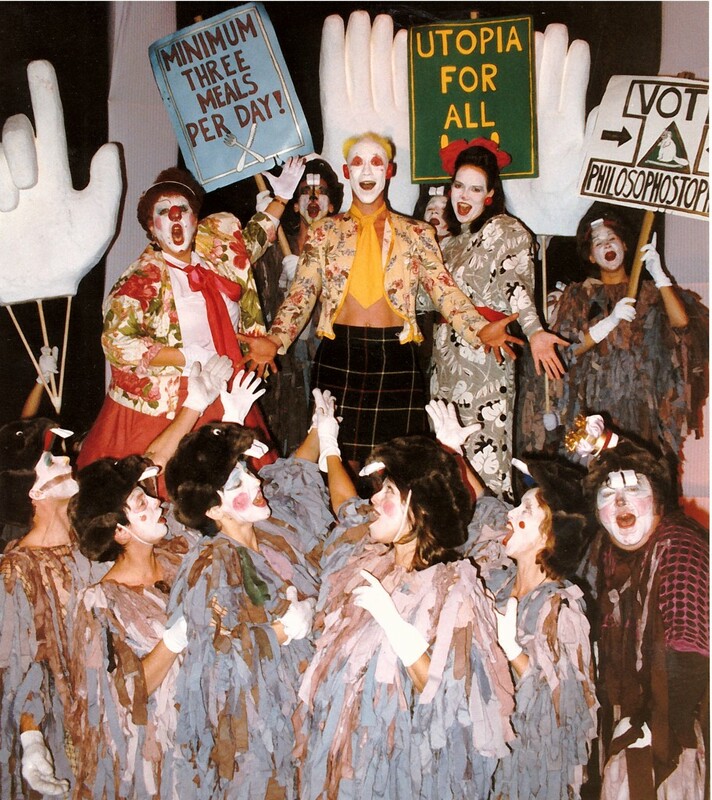 Kabaret de la Vita toured around Canada for two years, and in 1983 the TRC was invited to present it at the New York International Festival of Clown Theatre. Two years later, the festival featured the show again. John Towsen, a PhD in theatre history from New York University, was the festival’s artistic director. He was “particularly enthusiastic about Cheryl Cashman and Nion, two Canadian clowns who are the only performers making a return engagement from the 1983 festival,” reported the New York Times in 1985. Wallace’s one-man show was now an international success. During the 1980s, Pochinko and Wallace also worked with the Aboriginal theatre company Native Earth Performing Arts. For their work with Native Earth, Pochinko and Wallace adapted the clown through mask process to explore characters based on the Native North American Trickster. Among the participants in the workshops was future award-winning playwright and novelist Tomson Highway, whose influential plays would help catapult Native Earth into the mainstream. One of the plays on which the TRC and Native Earth worked together was called The Beavers. The musical play reflected on issues like environmentalism, world peace and the Earth’s demise. But no commercial or critical success could have prepared Wallace for what life had in store for him for the remainder of the decade. In 1986 he got a call from his then-partner — a singer who was away touring Europe and Asia with his band — who told him that he had tested positive for HIV. Wallace, who had already noticed some red and purple spots in his skin, went to get himself tested. “When I went and got my diagnosis, the doctor told me that I had probably six months to live,” he said. Pochinko, who accompanied Wallace to the doctor, cheered him up by saying, “It’s okay, everybody has HIV.” In the midst of the AIDS epidemic, the clown didn’t find Pochinko’s comment reassuring. The next three years were extremely productive for Wallace, Pochinko and the Theatre Resource Centre. Wallace and Pochinko continued working on original ideas and also started to explore how to integrate the clowning technique with scripts created outside of the TRC. But their creative relationship ended abruptly in 1989. Pochinko was hospitalized after becoming forgetful and behaving erratically. At the hospital, Wallace learned that Pochinko had AIDS, and that he had tested positive for HIV in 1987 but had decided to keep it a secret. Pochinko died five weeks after being admitted to the hospital. He was 42 years old. Last fall, while sitting in one of the trains of Vancouver’s transit system, Wallace met my eyes and asked me to take a look around. It was a little past noon and there were probably no more than 15 people in the car. “Everyone’s attention is on their cell phones,” he pointed out after pausing for a second. That morning, Wallace commuted for more than an hour to get to Ladner, B.C. A high school had invited him to teach a one-hour clown workshop. 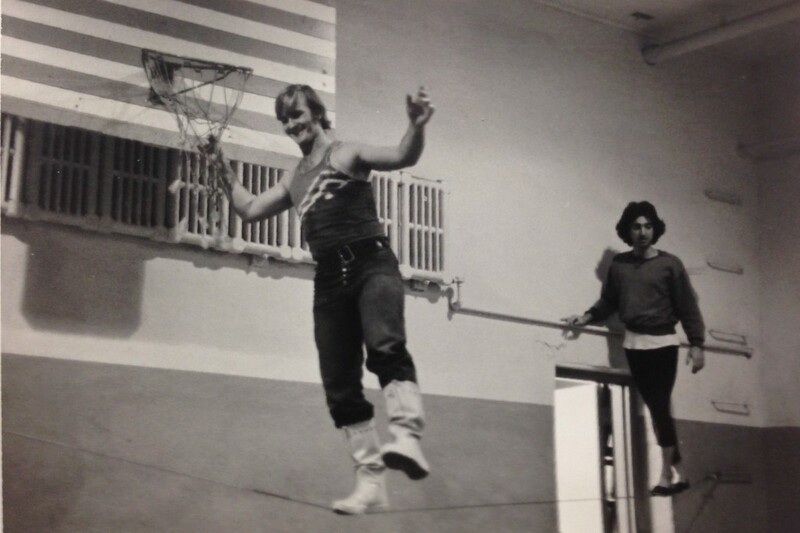 It was his first time teaching clowning at a high school in almost 40 years. In this day and age, when clowns have inhabited horror movies to become icons of fright, Wallace believes his approach to clowning can be particularly beneficial for kids growing up. It has been 28 years since Wallace was given six months to live, 25 years since Pochinko died. And 21 since Wallace left Toronto and the Theatre Resource Centre with the intention of spending his short, precious last days close to his family in Vancouver. From coffee enemas to fasting and from chemotherapy to acupuncture, he tried every treatment that became available over the years in order to survive. Wallace’s survival has given him the satisfaction of seeing the technique he co-created flourish and evolve. In the past 21 years, he has seen Michael Kennard and John Turner, former students of Pochinko and himself, take their critically acclaimed clown act Mump & Smoot across North America. He has seen Sue Morrison, a former student of Pochinko, further develop the technique and teach in South America and parts of Europe. And, nowadays, he is seeing Sara Tilley, who apprenticed with him five years ago, experiment with the use of masks in the production of literature as University of Calgary’s writer-in-residence. 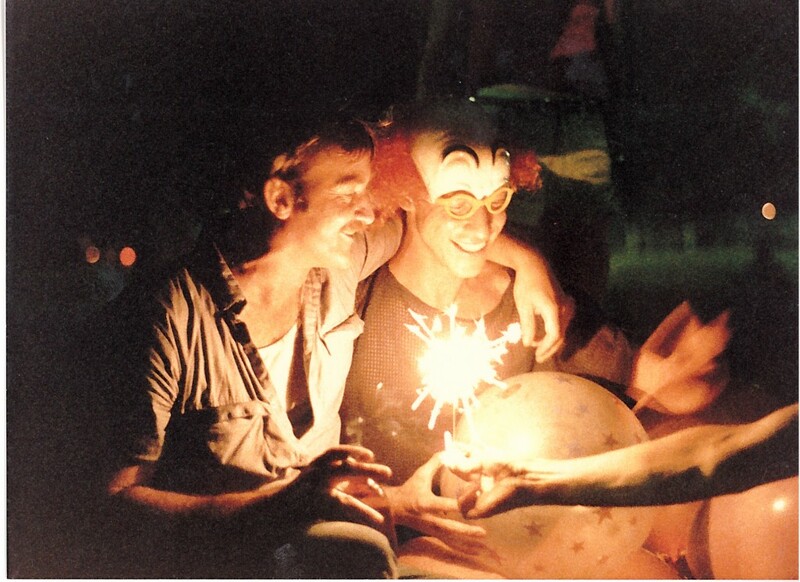 Survival has also allowed Wallace to continue developing the clown through mask technique and to teach it to new students. Making himself available for everyone who was interested in the work has been a great satisfaction, he said. Wallace believes the development of new clowns is crucial for our modern society. Clowns suited for our times are in great need, he claims, as our over-reliance on technology for communicating is dehumanizing us. But this is a different world than the one Wallace grew up in. The classic circus tradition has faded, and clowns are not popular entertainment icons anymore. Wallace is 70 years old. He is hard of hearing. His sight is diminished. He moves slowly, the sprightly leaps and tumbles of Nion consigned to vintage documentary clips. Recently, Wallace dreamed that he was in a dusty frontier town in the middle of a bright, golden desert. Looking at the horizon, he saw a beautiful buckskin-coloured horse walking towards him. Riding the horse was a blonde, radiant man, and, next to him, a woman rider, as radiant and golden as his companion. Behind them came another buckskin horse, this one riderless. After the horses passed Wallace, the riderless one turned its head and looked him in the eye. Wallace whistled to it, and the horse answered with a whinny. Wallace just stood there watching them. He saw the riders park their horses close to him and walk back to where he was standing. Wallace said that in his dream he tried to tell the riders that he was a clown, but they explained to him that they already knew. When he touched the female rider, Wallace recalled, he felt energy travelling from her body into the tip of his fingers. After a moment, they left. And he woke up. The dream reminded Wallace of the riderless horses that follow the casket in ceremonial funeral processions. Time is what Wallace craves these days. A little more time. Time to continue seeing the development of the technique. Time to see new breeds of clowns grow and mature. Time to tell more people the story. What a wonderful telling of the passion of Richard and Ian to bring their brand of love and healing into the world. I wish Ian more time, as we are grappling with clowns in many forms and a look into our own masks might be a way to ground our understanding and bring some perspective to our current circus.